For over 30 years, Century Sun Metal Treating has been servicing the metal working industry with high quality heat treating services. Producing the optimum metallurgical properties including excellent distortion control and uniformity of hardness have been our goal. Century Sun now offers a wide range of thermal processes to assist customers throughout the world. 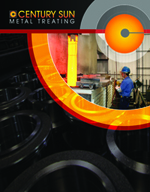 Many OEMs and steel suppliers to the industry now specify Century Sun Metal Treating as the vendor of choice. Detailed hardness inspections, special blasting, and protective packaging of finished parts are among the final steps taken before shipments leave our facility. We are always ready to provide the highest quality, fast and convenient service, and competitive prices. Century Sun offers a variety of hardening and surface treatments, so the best process can be selected for the customer’s tooling and specifications. Our new “Visual Shop” software program also offers complete documentation from order entry to final delivery, in order to assist with customer’s quality requirements. Our fleet of trucks assures customers of consistent turn-around and delivery time. Located next to a full-service, commercial airport, we can easily serve customer needs around the country. Our mission is to be “dedicated to customer satisfaction through continuous improvement, integrity, and teamwork.” Century Sun Metal Treating is serviced daily 24/7, by all major common carriers and expeditors throughout North America. Click here for a low resolution version of the brochure. Click here for a high resolution version of the brochure.